I'm not entirely sure what I expected when I picked this book up, but I'm not sure it was what I got. I know that sounds vague, and it is, but hear me out. 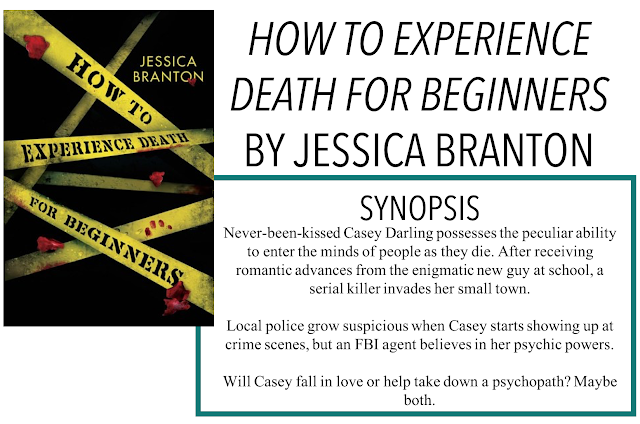 I am back with another book review, How to Experience Death for Beginners by Jessica Branton. Thanks so much to Mindbuck Media and Edelweiss for providing me with an e-ARC for an honest review, as always, all opinions are my own. This story follows Casey, a teen who can enter the minds of people as they die and see their lives - including their greatest regrets. Ever since her father died ten years ago, Casey has been coping with her ability and taking care of her twin sister while their mother is barely capable of making ends meet. When Cameron, a mysterious boy from California shows up at her school, Casey is suspicious - she has never liked getting close to new people. Then her small Georgian town suddenly falls prey to a serial killer, Casey becomes the sole witness to the murders. But will the police believe her? And does Cameron's sudden appearance have anything to the murders? I think the basis of this story has some good bones, but I think there are definitely some aspects that need work. The characters were a little flat to me and while we only had to deal with Casey's third-person POV, I felt like I barely knew anything about her, let alone the others. I enjoyed the dynamic between Casey and her best friend Danny but his being bisexual felt a little shoe-horned into the storyline. There was some chemistry between Cameron and Casey at the beginning but I felt like it fizzled out toward the end when things started to focus more on the murderer. There were points in the story where I felt like I had missed a part of the story. Specifically, with the reasoning for Casey's ability, I felt like we got a two-second explanation that was not at all fleshed out and were told to accept it and move on. I understand why it was done that way because of previous events, but I still don't know if I believe or even understand why she has the abilities she does. Even smaller things, like Cameron's guilt and self-harm, seemed like they were barely explained and we as the reader are just supposed to accept that and keep reading. Ultimately, I think what happened here was Branton was too ambitious with the scope of the book. She wanted to write a fast-paced thriller and a deeply-emotionally involved contemporary in the same book and it just doesn't work. In the end, both aspects suffered. Overall, this book might work for younger audiences who are enthralled by the small-town serial killer vibe, but for me, it was a miss.